At the Oratory we are in the unique position of having not one but three patrons. A patron is a saint who is venerated as a special intercessor before God. Mary's parents, Joachim and Anne, prayed every night asking God to give them a child. Six years after they were married, they welcomed Mary into their lives and they knew that she was a special gift from God. When Mary was three years old, Joachim and Anne took her to the temple and gave their child to God. Mary spent nine years in the temple. We also remember that the angel Gabriel was sent by God to tell Mary that she would bear a son through the power of God and that he would be called the Son of God. Mary, because she was ‘full of grace ‘said yes to God despite it being a testing and overwhelming decision to make. ‘Full of grace’ means that Mary was born without original sin. In 1854, Pope Pius IX proclaimed to the whole world that there was no doubt at all that Mary was conceived without sin. Four years later, she appeared to Bernadette at Lourdes. When St. Bernadette asked the lovely lady who she was, Mary joined her hands and raised her eyes toward heaven. She said, "I am the Immaculate Conception." Mary is a model of discipleship because she said yes to God and cooperated with God's plan by becoming the mother of Jesus. We honour Mary because she is the Mother of Jesus and our Mother as well. We can grow closer to God through Mary because of the special place she has in relationship to Jesus. Born in 1515 in Florence, he showed the impulsiveness and spontaneity of his character from the time he was a boy. In fact one incident almost cost him his life. Seeing a donkey loaded with fruit for market, he jumped upon its back. The donkey, surprised, lost his footing; the donkey, fruit, and St Philip tumbled into the cellar with him winding up on the bottom! Miraculously he was unhurt. His father was not successful businessman and at eighteen Philip was sent to work with an older cousin. During this time, St Philip found a favourite place to pray up in the mountains that had been turned into a chapel. We don't know anything specific about his conversion but during these hours of prayer he decided to leave all his worldly goods behind and dedicate his life to God. He studied philosophy and theology in Rome until he thought his studies were interfering with his prayer life. He then stopped his studies, threw away his books, and lived the life of a hermit. He spent much time in prayer in the catacombs of St Sebastiano. During one of these times of prayer he felt a globe of fire enter his mouth and set his heart a flame. This experience lasted a life time. He started speaking to others about God, everyone from beggars to bankers. Ordained in 1551, he went to live with a community of priests at San Giralomo. He and his associates held conferences in a specially built room called the Oratory in which people gathered for an evening of study and prayer that ended in music or a short pilgrimage to one of the ancient basilicas. Soon Philip gathered about himself a group of talented priests that he organised into the Congregation of the Oratory. St Philip was known to be spontaneous, unpredictable, charming and humorous. He had an uncanny ability to know what each person needed to bring them to God. For example one man came to the Oratory just to make fun of it. St Philip wouldn't let the others throw him out or speak against him. He told them to be patient and eventually the man became a Dominican. On the other hand, when he met a condemned man who refused to listen to repent his sins, St Philip didn't try gentle words, but grabbed the man by the collar and threw him to the ground. The move shocked the criminal into repentance and he made a full confession. Humility was the most important virtue that St Philip tried to teach others and to learn himself. One member of his Oratory who was later to become a Cardinal was too serious and so St Philip had him sing the Misere at a wedding breakfast. When another member gave a beautiful sermon, St Philip ordered him to give the same sermon six times in a row so people would think he only had one sermon. Officially recognised in 1575, the Congregation of the Oratory spread throughout the world and attracted illustrious members such as Blessed John Henry Newman. St Philip died in 1595 after a long illness at the age of eighty years. He was active until the end and celebrated as the most popular person in Rome. We often worry more about what others think of us than about what God thinks. Our fear of people laughing at us often stops us from trying new things or serving God. Do something today that you are afraid of or that might make you look a little ridiculous. Then reflect on how it makes you feel. Pray about your experience with God. 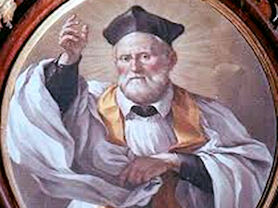 Saint Philip Neri, we take ourselves far too seriously most of the time. remembering always that humour is a gift from God. John Henry Newman was born in London on 21st February 1801, the eldest son of a London banker. His family were members of the Church of England. The young Newman learned at an early age to love the Bible and enjoyed reading it. As a teenager he experienced a deep religious conversion and resolved to spend the rest of his life in the pursuit of holiness. In 1817 aged sixteen he entered Trinity College, Oxford as an undergraduate. He made a few close friends but some students used to tease and make fun of him. Newman worked so hard in his studies that he fell ill and failed his exams. It was a difficult time for Newman and he found it hard to know what God’s plan was for him. Five years later he was elected to a Fellowship at Oriel College after taking an exam in which he did incredibly well. He was ordained as an Anglican clergyman and worked first as a curate in the Oxford parish of St Clement’s, and later became vicar of the Oxford university church of St Mary the Virgin. Newman went on a tour of the Mediterranean in 1833 with a friend who was in very poor health. While in Sicily he himself fell seriously ill with fever. He recovered and was convinced that God had spared him to perform some special work in England. On his return home he eagerly became a leader in what came to be known as the Oxford Movement. In 1843 he retired to a converted stable block at Littlemore just outside Oxford, to think and pray. He was joined there by a number of his young followers and together they lived an austere semi-monastic life. Late in the evening on 8th October 1845, an Italian priest, Father Dominic Barberi (now Blessed), came to Littlemore. For several hours he heard Newman’s first confession, and the next day he was received into the Catholic Church. When Newman became a Catholic many of his relatives, friends and colleagues never spoke to him again. Some, throughout his life, would try to undermine and cause discontent in relation to his ministry. 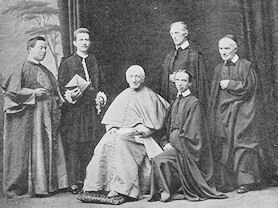 In 1846 Newman went to Rome to study for the priesthood and was ordained a priest there on Trinity Sunday 1847, at the age of forty six. 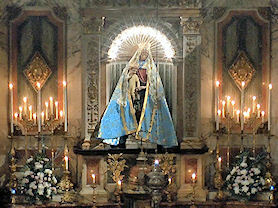 In Rome he was attracted to the Oratory of St Philip Neri, a Congregation of priests and brothers founded by St Philip Neri in Rome in the sixteenth century. Newman became an Oratorian and in 1848 he established the first English Oratory at Maryvale near Birmingham, moving soon afterwards to Alcester Street near the town centre, where he converted a disused gin distillery into a chapel. Three years later the new Oratorian community moved to its present home in Edgbaston. Newman was a prolific writer of letters, sermons and articles, and this continued throughout his life. His work was sometimes misunderstood, and a number of projects that he was asked to lead or support seemed to come to nothing. At times he must have felt that he was living constantly under a cloud of disapproval – yet he never gave up! In 1879 aged seventy eight he was made a Cardinal of the Holy Roman Church by Pope Leo XIII. Newman chose as his motto the words "Cor ad cor loquitur" (heart speaks to heart). He lived out the rest of his days, quietly and prayerfully, and still writing, at the Birmingham Oratory. He was taken to his eternal reward on 11th August 1890. His funeral procession from the Birmingham Oratory to Rednal attracted crowds of 15-20,000 onlookers, and he was lauded in the national press both in England and abroad. In 2009 the Holy See confirmed the miraculous cure in the USA of a man studying for the diaconate, Jack Sullivan, who was suffering from a crippling spinal disorder. Through the intercession in heaven of Cardinal Newman he was cured and able to pursue his vocation. That miracle paved the way for John Henry’s beatification. Our school was fortunate to welcome Jack Sullivan in 2009 where our children - TNTNews journalists – interviewed him. At the Oratory, we all try to follow in the footsteps of Blessed John Henry Newman by ‘Shining as to be a light to others’ for Jesus!